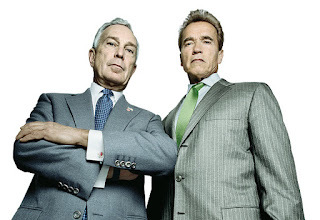 Bloomberg and Schwarzenegger photographed together for Time. California is poised to trump New York City’s progressive position as the first major metropolitan city to ban trans fats, by becoming the first state to enact a ban. Their state legislature passed a bill Monday to ban trans fats, which currently awaits Governor Schwarzenegger’s signature. While the SF Gate reported that the Governor has not taken a position, one hopes that in a state known for healthy living and as a politician who has been active in the efforts to curtail childhood obesity, that the Governor will pass this bill. While I support personal responsibility and the need for better health education in our schools, in this case, where the health effects are clearly documented and other government bodies have done very little, I do believe that local governments must intervene. On a visit to the FDA’s website (my favorite stomping ground), I found a document titled “ Questions and Answers about Trans Fat Nutrition Labeling”. While the document was long and did include a wealth of information regarding trans fats, this question and answer set struck me as interesting. "Q: Should trans fat be eliminated from the diet? A: No. According to experts, eliminating trans fat completely from the diet would require such extraordinary dietary changes (e.g., elimination of foods, such as dairy products and meats that contain trans fatty acids) that eliminating trans fat could cause an inadequate intake of some nutrients and create health risks. " 40% cakes, cookies, crackers, pies, bread, etc. In case you're not great at math, this table tells us that 21% of trans fats come from animal products and 79% come from processed food. On top of this, it is widely known and accepted even by the FDA that trans fats raise LDL (bad) cholesterol, which accumulates on artery walls and that they lower HDL (good) chilesterol. So, if we know trans fats are bad for us and we know food can be made without trans fats, and there is little discernible difference as to how the food tastes, why then is the FDA unwilling to consider a ban that would significantly reduce Americans' exposure to bad fats? Let me pose this as a multiple choice question. Unilever, the world's largest producer of margarine saw 22billion in annual sales for savory dressings and spreads in 2007. In 2005, Unilever spent the most money they’ve ever spent in lobby fees topping $1.1 million. Coincidentally, the same year the NY Times published this article titled “The Panic Du Jour: Trans Fats in Foods” and New York City began discussing the possible ban. Pfizer, the key patent holder on Lipitor, a cholesterol reducing statin saw sales of $12.7 billion in 2007. Hank McKinnell, Pfizer’s former CEO raised over $100,000 for President Bush's most recent campaign and Pfizer executives gave his campaign more than $110,000, and just for good measure the company gave the RNC more than $2.5 million in soft money between 2000 and 2003. The former commissioner of the FDA, Lester Crawford, plead guilty to breaching FDA conflict of interest rules twelve months after his resignation in 2005. As it turned out, he and his wife held shares in four companies that he was required to have sold, under FDA rules. These companies included the food companies Sysco and PepsiCo. In his time at the FDA, he was the chair of the FDA's Obesity Working Group and was working on reviewing calorie-content labeling for soft drinks. After Crawford's resignation he became Senior Counsel at the Washington D.C. lobbying firm Policy Directions Inc. In 2005, Policy Directions clients included Kraft Foods, the Pharmaceutical Research and Manufacturers of America, Nestle, Merck and the American Feed Industry Association. So while the opponents to the ban continue to site unhappy restaurant owners, who I am sure are storming Sacramento right now, let’s hope the Governor who has been quoted as saying “California is facing an obesity epidemic. Over the past decade, Californians have gained 360 million pounds.” will take this to heart and pass the trans fat ban before the end of the day. I hope they do ban it and I'd also like to see high fructose corn syrup banned as well. Update - One week later California is the first state to ban trans fats. Yay!